Redpoint Network Services, Inc., a developer of network performance monitoring software, has been acquired by NetQos, Inc. The acquisition will provide NetQoS with enhanced web-based performance management, analysis and reporting capabilities. 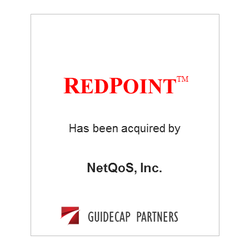 ​GuideCap Partners served as the financial advisor and negotiated the transaction for Redpoint.